Tony Sagami writes: With all the great economic strides China has made, it is sometimes easy to forget that China is still a communist country and is controlled by the Communist Party of China. Part of that Communist control is over prices. The National Development and Reform Commission (NDRC) controls the prices on thousands of items: Drugs, grain, edible oils, pork, noodles, milk, eggs, cigarettes, cloth, steel, train and bus fares, cement, fertilizer, college tuition ... and fuel. Last week, the NDRC raised the price of gasoline and diesel by 17% and 18% respectively. If rising fuel prices are bad for the U.S. economy, they must be just as bad for the Chinese economy, right? At least that is the popular advice being delivered by many of the so-called experts and financial shrills on Wall Street. It would be a huge mistake to think this fuel price increase will somehow derail the Chinese economy! Reason #1: Gas prices are not nearly as important to the typical Chinese citizen , who doesn't even own a vehicle, let alone drive a gas-guzzling SUV. Most people walk, ride a bike or scooter that gets 100 MPG, or use public transportation (buses, rail, or subway) to get around. The first mention of bicycles in China was in 1860, when a European official wrote of seeing a velocipede, an early version of the bicycle, newly-arrived from Paris. 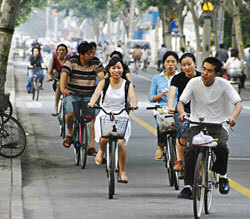 Nowadays, China is known as the world's bicycle kingdom. The result is that transportation costs are a very minor monthly expense for Chinese consumers. In other words, higher fuel costs are not hitting disposable incomes in China like here in the U.S. The most recent retail sales numbers in China showed a 21% jump in May compared to the same period 12 months ago! Reason #2: Gas is still cheap in China. Prices are still under those in the free market. Even after this increase, a gallon of gas costs about $3. That's 25% less than what we pay in the U.S. The result is that Beijing is still subsidizing the cost of fuel across China ... just not as much as before. Reason #3: The last price hike did not slow China's economy. There seems to be no correlation between higher fuel prices and an economic slowdown in China. The NDRC raised fuel prices by 10% last November when oil was $90 a barrel but the Chinese economy didn't miss a beat. 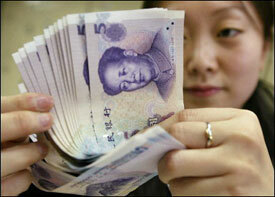 China's GDP grew by 11.9% in 2007 and the World Bank just upped its 2008 forecast to 9.8%. All statistics indicate that China is still growing like a weed. Look, China consumed an average 7.86 million barrels of oil per day in 2007 — 9.3% of the world's total. Meanwhile, the United States went through 20.7 million barrels of oil per day or 24% of the world total last year. So if any economy is going to suffer from rising oil prices, it's the U.S., not China. If anything, I think the Chinese economy is actually going to improve because of this price increase! Many parts of China have been suffering from moderate to severe fuel shortages because fuel retailers Sinopec and Petro China simply shut down many of their gas stations. Reason: Because prices were being kept too low, they couldn't make money. It was easier to just not run the pumps. Now, it will become easier for gas retailers to turn a profit again. Stations that have been bone dry will soon have plentiful supplies of fuel. Motorists and truckers that were left stranded or paying sky-high black market prices can get back on the road. Long waiting lines and fuel shortages will be a thing of the past. And as a result, the economy will pick up steam! What was an economy hamstrung by artificial price controls, fuel shortages, and uncertainly ... is now largely unshackled and ready to soar even higher. Chinese Stocks Look Every Bit As Attractive Now As They Did When the Market Bottomed in 2005! Against that fuel shortage backdrop, Chinese stocks have taken it on the chin. As measured by the Shanghai Composite Index, Chinese stocks have dropped 46% so far this year, and are down by more than 50% from their November 2007 highs. Believe it or not, these types of drops aren't uncommon in China. For example, the Shanghai Index lost 55% from June 2001 through July 2005, years in which the Chinese economy grew by an average of 9.5%. Buying the dips in China has proven to be a stunningly profitable investment strategy. But if you had bought in after that 55% drop, you could have made 600% on your money in just two short years! Clearly, investing in China can be a roller coaster ride, but buying on these dips has been ... and I believe will continue to be ... an extremely profitable strategy. Remember, we're not talking about dotcom pieces of junk that don't make any money. The Chinese companies that are now on sale are part of the foundational building blocks of the Chinese economy — construction, retail, energy, finance, health care, food, and transportation firms. They have real revenues and real profits. You now have the opportunity to buy their stocks at a 50%-plus discount! Plus, you have a key economic catalyst — the elimination of fuel shortages — to jump start the economy, pump up corporate profits, and rejuvenate Chinese stock prices. Bottom line: You may want to consider adding some Chinese investments to your Asian portfolio. I think you'll be very happy with the results a year or two down the road. The issues you mention may be true. However those are not the only issues. As stuff costs more to ship more manufacturing will move back to the US. China is freak show dictatorship. Their aging population is going to be a major problem. As usual, "experts" disagree about the viability of China, or any other country, in the current economic environment. It would be nice to get some straight answers, for once. Then it dawns: It's all supposition. The truth: Those with money will continue to make money. Those without money are irrelevant.